Its late fall, late autumn, the year 2007. Ive already existed in this body  which I do keep fit, I must admit!  already much longer than I had expected, and Stockhausen has stayed in his bodily vessel 21 years longer than I, so were both stretching our Earthly journeys, and nobody knows much about our spiritual ones, but they go on for ever and have gone on forever, and were hopefully ascending through clearer and clearer space, soaring through lighter and loftier realms, life by life! I put on COSMIC PULSES without knowing what to expect. From Stockhausen you never can tell, and that is why it is always so exciting to break a package from the Verlag and uncover the new works, because it is never what you thought, if you thought anything at all, because Stockhausen always finds new ways, is inhabited by brand-new thoughts, and ever since his youth he has kept  and developed  a super-human will and energy and a mind that can construct compositional plans that must impress even the craftiest scientist or the most stubborn mountaineer through brisk stages of life. Yes, its late 2007, under dark skies and moist winds that tear my hair and the trees of the forest through the night, and sometimes I feel that the murmur and whine of the squalls and gusts in the moonless darkness are the collected voices of spirits lost in lasting pain. In my apartment I am safe, surrounded by walls of books and CDs, and the sweet fragrance of Nag Champa incense from India, and I have just started to listen to Stockhausens COSMIC PULSES. It is a music that I could not have foreseen, and which moves me deeply and way beyond my expectations, though high they were! Right now I sense that Im at the very beginning of a new, great adventure, which will open new ways of thinking and feeling to me, just as I began to feel a deep need for that kind of change, that kind of freshness, that kind of de-dusting shake-down of the senses! 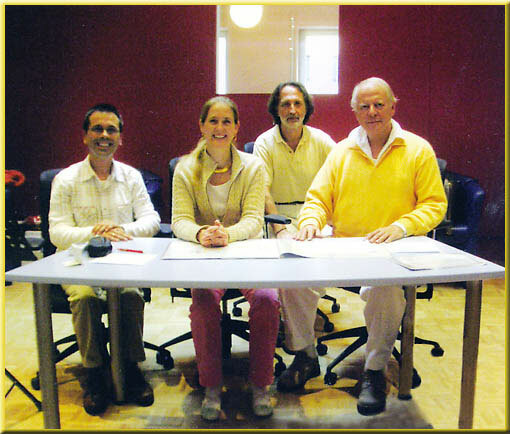 In fact, Stockhausen himself, when deep in thought about COSMIC PULSES, which he was in the late compositional stages of at that time, stated in a brief message of March 2007: What I am trying since December to realize in COSMIC PULSES goes far beyond my experience  it must be ready for the world premier on May 7th in Rome. And for sure it was; a good friend of mine flew down there for the occasion and reported back to me about the almost alien experience of something completely original. As I listen now, for the first time, I sense the complicated and wild, yet behind all the turmoil strangely orderly sound, swelling and contracting under my senses like the black/blue/gray oceanic motion of a tempestuous cloud-cover, seen from an air-plane that feels like an immobile vantage point in a world that takes place around you. I fill up with a sense of joy at this bottomless composition, at the fact that it was possible to conceive it, to go through with it, in this shallow society, in 2007. For once we dont need to look back, search behind, for something masterly, something bursting with avant-garde ingenuity and great courage: Stockhausen, at 79, sits down at his Kürten desk in 2007 and thinks, and hears things no one else has heard  committing it to the music paper, in his beautiful handwriting, stringent and characteristic. This is the equivalent of receiving KONTAKTE or GESANG again, but in a contemporary mode, straightforward, mystery in our face like wildfire and swirling clouds of forest fire smoke, perhaps a sound akin to what youre supposed to hear in an overwhelming way when you leave this life and pass into the Bardo of afterlife according to Tibetan Buddhism. It is brave of Stockhausen to compose this. A lot of folks are going to freak over this; especially those pale intellectuals who always need to foresee things, and who need to brand things, put occurrences in their little boxes  because no way theyre going to be able to grasp this: its a big slap in their faces, a Zen Buddhist wake-up call! I can hardly imagine what it would be like hearing COSMIC PULSES with its proper number of channels! Id like to be able to do that some day; lose myself in that intricate, many-headed, thundering Bardo! I work late at night now, sipping black coffee, jotting down these observations in a rickety fashion on a 24 inch iMac, while I scan pictures for the review on another, old Mac at the far end of the desk, all the while gushing COSMIC PULSES through a couple of high end earphones, Stockhausens sounds invading my brain in smoky motions; a wild, torrential Ballet Severe! A good friend of mine, who passed away unto his next life in the 1990s  composer and painter Rune Lindblad  sent me a woodcut once, picturing a man walking in great strife through a thunderstorm  and somehow this is one of many feelings that COSMIC PULSES give me; a very visual sensation that also involves quite naturalistic notions, of hard rain on my face, of wet clothes sticking to my body, and a kind of danger that comes with the territory: its hazardous to live, nicht wahr? with Stockhausens spiritual adventure music in your ears! Do it!
] 24 melodic loops, each of which has a different number of pitches between 1 and 24, rotate in 24 tempi and in 24 registers within a range of circa 7 octaves. The tempi 240  1.17 apply to sequences of 8 pulses. Thus tempo 24 [inside a square] means: 240 x 8 = 1920 pulses. 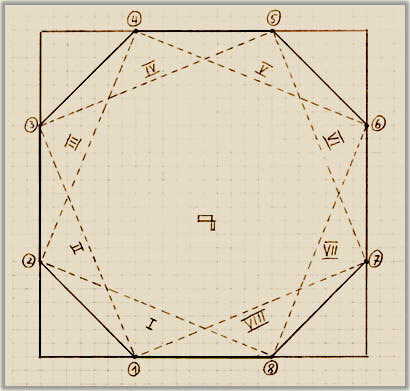 Thus tempo 1 [inside a square]: 1.17 x 8 = 9.36 pulses per minute. The loops are successively layered on top of each other from low to high and from the slowest to the fastest tempo, and end one after another in the same order. For the first time, I have tried out superimposing 24 layers of sound, as if I had to compose the orbits of 24 moons or 24 planets (for example, the planet Saturn has 48 moons). For making this possible, I am grateful to Joachim Haas and Gregorio Karman, collaborators in the Experimental Studio for Acoustic Art in Freiburg. The loops and the synchronization were realized by my collaborator Antonio Pérez Abellán. I whisked off an afternoon email to Stockhausen with the intent of possibly clearing some of the mist away from the mystery of the origin of the ideas that sprouted and bloomed into the fully-fledged mastery of COSMIC PULSES. Stockhausen immediately replied via email, but graciously let on that he, neither, had any knowledge of where the ideas came from: No, I never know where the ideas come from. 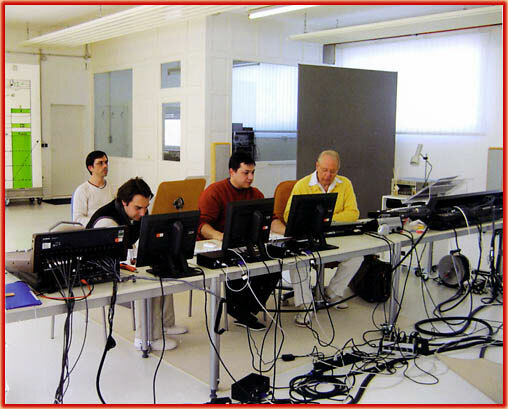 However, he submitted a rich studio report, penned by Gregorio Garcia Karman, entitled STUDIO REPORT  Spatialization of Karlheinz Stockhausens COSMIC PULSES. Its a 14-page (A4) document with a scientific, technical text as well as graphic material, and for anyone knowledgeable and interested enough, its one prime essay! 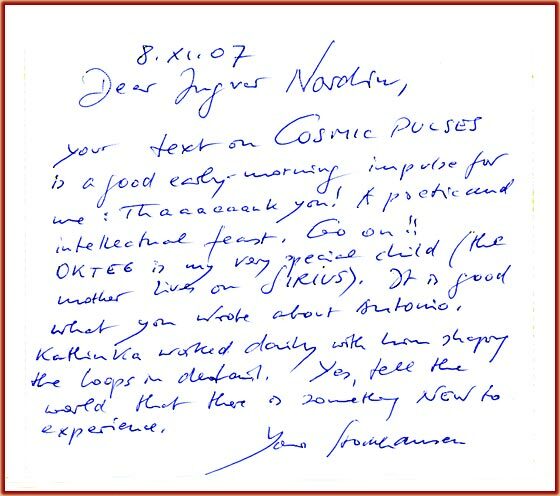 The system developed for COSMIC PULSES [Reviewers note: Yes, an electronic device was built purposely for COSMIC PULSES, the OKTEG  Oktophonic effect generator  reminding me of other times when specific developments were needed, like in the case of the ring modulating machinery built especially for MANTRA] is based on a spatialization device  the OKTEG  handling the real-time panning of eight simultaneous layers, coupled together with a Digital Audio Workstation (DAW) in charge of layer playback, trajectory recording and mixing tasks. The core of the OKTEG is a Max/MSP patch that implements eight variable-law amplitude-panning modules, each of them driven by a sequencer with its own tempo control. Different tempo tunings and ranges were discussed during the production stage of the OKTEG. The slowest rotation period chosen in the end was 16 seconds, and the fastest 0.0625 seconds (i.e. 16 rot/sec). Tempo for each OKTEG channel can be varied continuously within these two boundaries by means of motor-faders. A tempo scale with 24 steps was defined, for being used in COSMIC PULSES as 'tempo keynotes' for each one of the 24 of the layers. 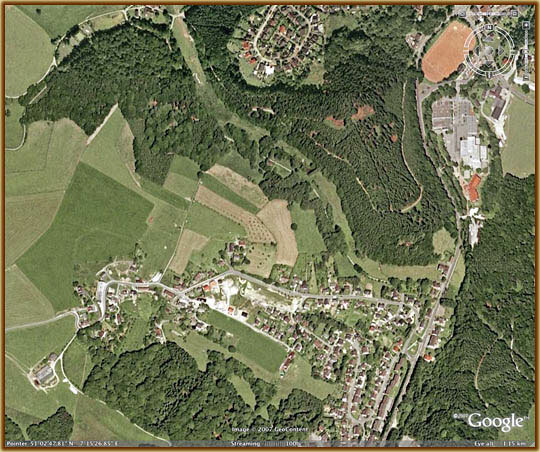 In this section, the spatialization procedure that was followed is described. Initially the ProTools project is loaded with the 24 raw sound layers to be spatialized. The first step in the production is processing layer -B24- through the OKTEG. Playing the OKTEG involves real-time performance of rotation speed and level during the length of the layer by means of motor faders. The spatial information, encoded as a frequency-modulated sawtooth, is recorded in track K24, while dynamics are stored as standard level automation data in track B24. This action is repeated eight times for each of the subsequent tracks, while hearing the previously performed layers as in an overdubbing process. Spatial movements are rendered live through the OKTEG insertions, thus speed and level corrections can be made before down mixing the first 8-packet to the eight D- tracks. Once consolidated, the original B-layers and the control K-tracks are deactivated in order to free resources, but still if any adjustments should be needed after bouncing, the tracks could be effortlessly made active again. The same process described in steps (2) and (3) is repeated with the second 8-packet -B16 to B9- in order to obtain the second down-mix. These tapes are to be played with three DA98 machines running simultaneously (time-code synced), which should be combined in an external mixing console for projection over eight loudspeakers according to the before given routing diagram. The second master set is based on the eight-track reduction of the 24 D-tracks. The down-mix was digitally transferred to one DA98 to produce an eight-track version master tape. Each of the eight tracks of this tape corresponds, one-to-one, to each of the loudspeaker channels. 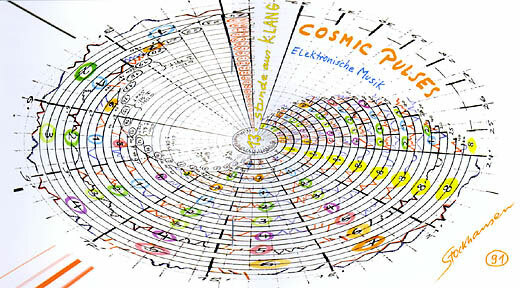 In his list of references, printed on the last page of the Studio Report for COSMIC PULSES, Karman mentions, among other texts, an essay by Stockhausen, printed in Texte zur Musik 1970  1977, called Die Zukunft der elektroakustischen Apparaturen in der Musik, which is a summary of a lecture that Stockhausen held on the 26th of October 1972 at the Westdeutsche Rundfunk  WDR  in Cologne. It is an interesting prophecy of the developments concerning the implementation of electronic devices and methods in the creation of music in the future, as seen from the vantage point of the early 1970s, by the one person who most fiercely maintained and manifested the boundless possibilities of sound-processing equipment and creative musical thinking, all the way from the early 1950s. He says, among other things  and I interpret approximately from the German  that the tendency goes towards a situation in which a musician, vocal or instrumental, albeit educated by a good teacher, must familiarize himself with all the possibilities of sound-making and sound transformation. He further states that a type of musician that no longer identifies himself with one single instrument, but who can have at his disposal all kinds of sound colors and sound transformations, including his projection of the sounds in any auditorium, in elective directions, at velocities of his choice, will arise. He then goes on to describe two machines that he has developed, and which were being constructed at the time of the talk in the early 1970s: a Klangwandler  a kind of sound processor  that he evolved on the basis of a Modul 1969 A, and a Rotationstisch  a rotating table  that was an improvement of the one he used in the production of KONTAKTE. The most interesting aspect of this essay/lecture  for me  is what this development of sound tools says about the composer, about Karlheinz Stockhausen. 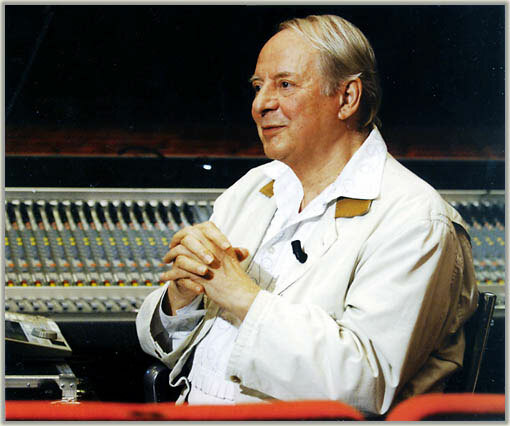 Most composers  almost everyone  would make do with whats on the market, and adjust his ambitions to that fact, but not Stockhausen, not in the 1950s, nor in the 1960s, nor indeed in the 2000s! Here he goes again, closing in on 80, demanding new machines to be able to let others hear in air compressions what he already has heard in his mind, and for which there were no machines precise enough on this contemporary market with countless gadgets and devices! Stockhausen, instead of falling in line, adapting to the possibilities at hand, makes sure new possibilities come into being; commissions technicians that are clever enough to hear exactly what it is that Stockhausen wants, and who are able to construct new sound tools in close collaboration with the Maestro. This stubbornness, this will, is so strong I almost feel afraid, but most of all I feel joyous, for what is this, if not a demonstration of the blowtorch property of the human spirit; this endless hunger for light! Wonderful! no, not listen TO, because you cant stay outside of it when it roars towards you and engulfs you: You listen IN COSMIC PULSES, right inside the torrent! However, my description may sound like COSMIC PULSES can be perceived but as one, brute, blunt tour de force of violence and danger. That is  be sure to note!  not the case. Inside these violently moving Jupiter storm clouds, youll discover innumerable delicate, minuscule Planck-length vibrations, at the core of sound, at the core of core; tiny, multi-dimensional twitches and tics right in the face of the complete standstill of the horizon of events, beyond which even hypothesis is hypothetical, and thought unthinkable. That is how deep this music cuts, how low it flies, and how lofty and distant it may rise, like a horse on its hind legs, neighing loudly between the star clusters as you suddenly change perspective, involuntarily, the way you may change point of reference in an optical illusion. In COSMIC PULSES you shoot from macro to micro and vice versa in a flash, completely altering the way you perceive the sound and your own spatial predicament. The duration of COSMIC PULSES, including fade-out and silence, is 3258. It comes in one single track on the CD. 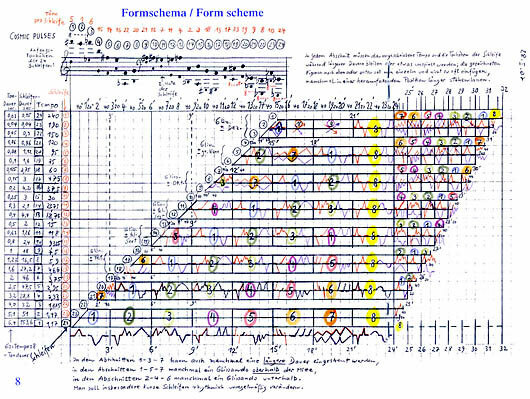 Then come 24 tracks with the beginning 90 seconds of each of the individual layers of COSMIC PULSES, preceded by a brief introduction in German and English by Professor Stockhausen. 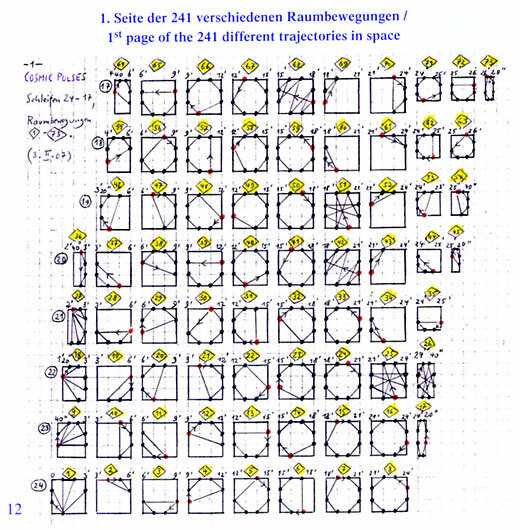 Stockhausen starts with layer 24, counting backwards down to layer 1, presenting each layer: Anfang Schicht 23; beginning of layer 23, and so forth. Hearing them in full clarity like this opens up new insights into the sound as it storms in its completeness. Antonio Pérez Abellán is a deeply knowledgeable and skilled musician, and his role in the production of COSMIC PULSES should not be under-estimated. Ive seen and heard him play the synthesizer on a great many occasions down in Kürten, and it has always been a great experience. He has realized the loops and their synchronization here. His spirit is very benign and charitable, beneficial and salutary  sometimes I think he is slightly more than human, with one foot in an enchanted world of wonders and secret beings! His smile stays with me! and can you find the White House? And Stockhausens voice on these recordings of the 24 layers also puts me in a state of pleasantly hovering inspiration, reminding me of the many times Ive heard him speak in Sülztalhalle in Kürten. I hope Ill be as young as he is, when I reach 79. 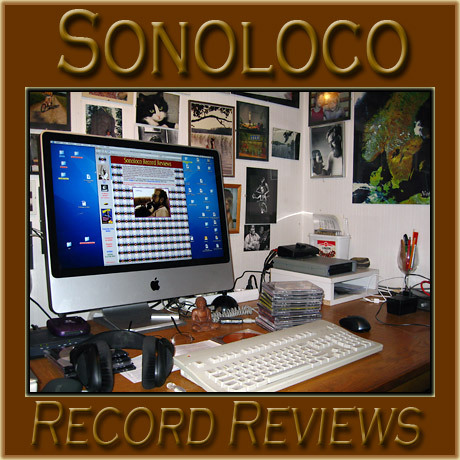 COSMIC PULSES is one of those seminal works that put a whole music culture into perspective. Listen up, folks!